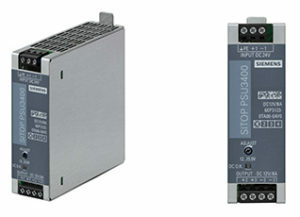 Siemens is extending its range of DC/DC converters with the launch of its new range of Sitop PSU3400 devices for the lower output range up to 120 W. The new power supply units ensure stable output voltage even with voltage fluctuations of ±25%. User benefits include a high degree of efficiency (92%) as well as safety during operation due to the broad input range with reverse polarity protection. The five new Sitop PSU3400 DC/DC converters have a narrow, 32 mm metal housing. With an overall width of only 32 mm, the five new power supply units have an extremely low space requirement on the top hat rail. The narrow power supply units provide stable nominal output voltages of 12 or 24 V DC with nominal input voltages of 12, 24 or 48 V DC.